Blurry photo, had to get the packet back out of the bin! Another Chinese supermarket impulse buy – saw the word vegetarian on the packet, bought it and then let it sit in the cupboard for years and years. When I did some research I discovered it’s popular in Malaysia, Singapore and parts of China and is made with pork ribs and herbs. The sachet is just the dried herb mix which you use to flavour the broth. 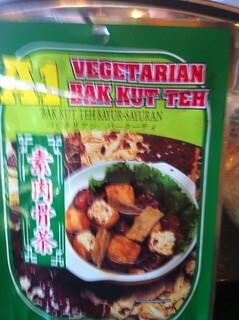 I looked around for vegetarian versions and found this which I used as the idea for my soup. I soaked some fine rice noodles separately and then to the broth I added tofu puffs, dried mushrooms and a drained tin of bamboo shoots. 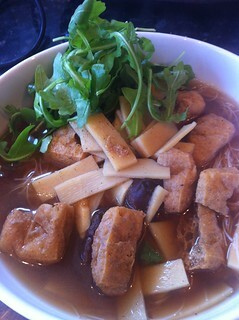 I poured the broth over the cooked noodles and then put some fresh rocket on the top. When the broth was heating up we both thought the house smelt like the back streets of Kuala Lumpur – a strong herbal scent which was unusual but not unpleasant. The soup itself was very tasty – the rocket worked well with its sweet undertones and gave it a fresh feel. I don’t think I would bother to buy this sachet again but it made for a tasty and unusual lunch. Do you know and love this soup? This entry was posted in VeganMoFo 2012 by efcliz. Bookmark the permalink.